Jason T. Clark gets a little emotional when he talks about his mother and her arduous job of corralling a group of singers and fine-tuning their voices into a melodic blend of traditional and contemporary gospel music. The beat will go on Sunday, Nov. 15, when Clark pays tribute to his late mother, Fannie Mae Cole Clark, and when The Tennessee Mass Choir, the choral group she founded in 1990, celebrates its 25th anniversary at First Baptist Church-Broad, 2835 Broad Ave. Hosted by Michael Adrian Davis of 95.7 Hallelujah FM, the concert will start at 5 p.m. Special guest artists include Karen Brown, Everett McBee, Tara Clark, Tabitha Adams, and more. The concert is free and open to the public. Fannie Clark, who once led The Fannie Clark Singers prior to founding the TMC, died in 2013. She’d become an integral part of the local gospel music scene and was regarded as the quintessential choirmaster. Mrs. Clark led, directed and promoted the TMC, using wit and personality to bring attention to the choir and her ministry. She was a one-woman, public relations guru, who would ferry press releases and photos to the media and follow up with a kind word. She was determined to catapult the choir to the “big stage, ” on which they’d eventually share with nationally known gospel recording artists such as Fred Hammond, John P. Kee and Shirley Caesar. 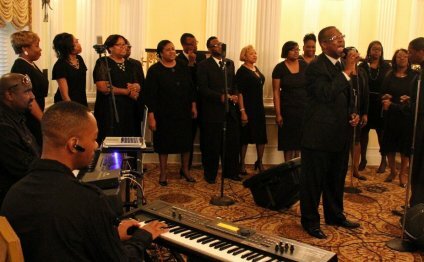 They’ve also performed at upscale events such as the Titanic Exhibition, the Memphis Sunset Symphony, and the Southern Governor’s Regional Convention. “She prepared us well, ” said Clark, one of his mother’s four children. The Rev. Derek Clark, pastor of Rejoice in the Covenant Church in Memphis, is the eldest, followed by Mignonette Clark Durham of Carrollton, Texas, Jackie B. Clark, and the youngest, Jason Clark. The “family” consists of 35 members, in addition to the seven or eight choir members Clark added after he took over as choral director. He brought on new members, he explained, to expand the choir and to take them farther in ministry than where his mother had taken them, including adding to their repertoire of songs.